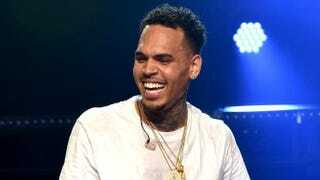 Chris Brown just experienced a terrible ordeal: His Los Angeles-area mansion was looted in the wee hours of Wednesday morning, but it was his aunt who came face-to-face with the three burglars, the New York Daily News reports. According to police, three armed black men wearing bandannas over their faces made their way into Brown's mansion, held his aunt at gunpoint, locked her in the closet and then got to business, ransacking the mansion for its expensive goods, Brown's personal items and cash. Brown was at a club at the time of the robbery and came home around 4 a.m. to speak to the police about the incident. Police say his mansion has a video surveillance system, so hopefully it'll provide more information about the armed bandits. This isn't the first time Brown's residence has had an intruder. A few months ago, Brown found a naked 21-year-old woman in his bed; she vandalized his house and car.